DESCRIPCION CORTA: Nuevo diseño: 4 Wheel Drive coche a escala 1: 16. Diseñado con docenas de tornillos, hacer carreras de coche firme y duradero para mufti-terrain, sin ningún tipo de problema en funcionamiento en desierto, alfombra, azulejos, carretera, zacate, charco, barro, etc. Carreras todoterreno: larga vida útil del tronco depende de solvencia materiales de alta calidad más resistencia y choque. Clase IPX4 resistente al agua hace que sea alcanza el agua. Ruedas de goma suave y elástica, a prueba de golpes y antideslizante. 4, enlaces y muelles de suspensión, Sistema y protege los componentes electrónicos. Sistema de gran potencia: el motor de gran potencia y cuatro ruedas deriva trae más alta velocidad es de hasta 21.7 mile/h, alimentado por una batería de 7.4 V 500 mAh para ejecutar hasta 10 – 15 minutos; El paquete viene con 2 pilas, no de largo tiempo para cargar, simplemente reemplazar la batería y listo para ir. 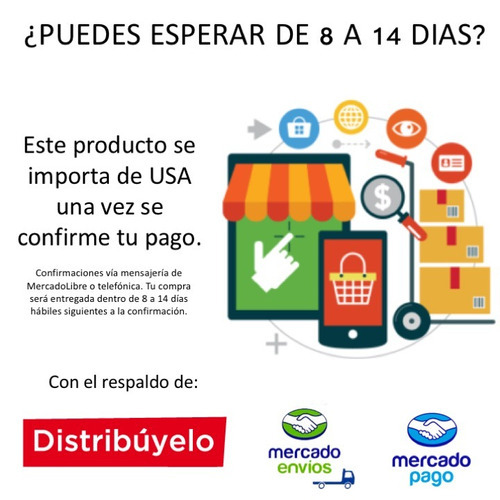 Fácil de operar: profesional sistema de control integrado. Adelante/atrás, girar a la izquierda/derecha, Drift, freno, trepar. Manera fácil para ayudarle a casa de distancia. Disfruta del mejor momento con el que usted desea. Radio control: increíble. Hasta 196.9 foot distancia mando a distancia. Las pieles sensibles y mando a distancia de 2,4 GHz fiable hace que sea verdadero. Mantenga su buggy bajo control completamente. DESCRIPCION LARGA(contáctenos para traducir): Want to enjoy an exciting car racing? Come to us! 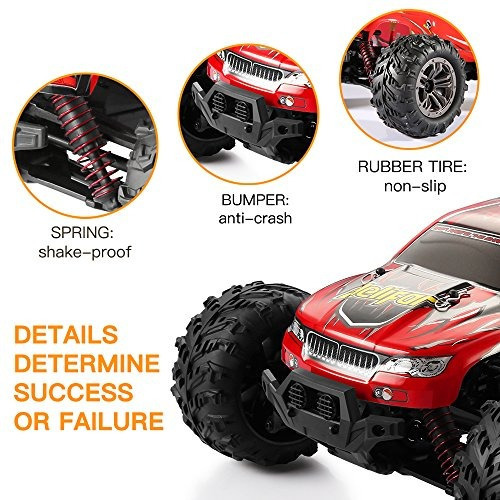 We specialize in providing top-class remote-controlled racing cars! 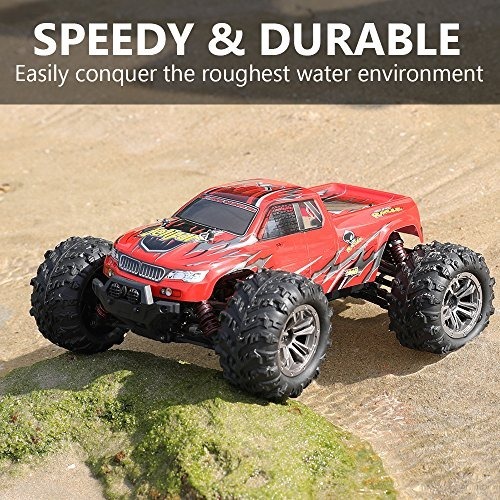 Our remote-controlled racing cars possess quite stable performances: equipped with 4WD system to run constantly on the sand, lawn, marsh and uneven road; the highest speed is up to 36 km/h, six times faster than other common cars! 1 : 16 Scale and inside simulation design give you a great surprise! Made of high quality plastic and rubber, it shows a good anti-crash performance. Strong bi-motor increase the climbing force power; can run on the sand, grass and marshy land, finish lots of difficult movement easily. 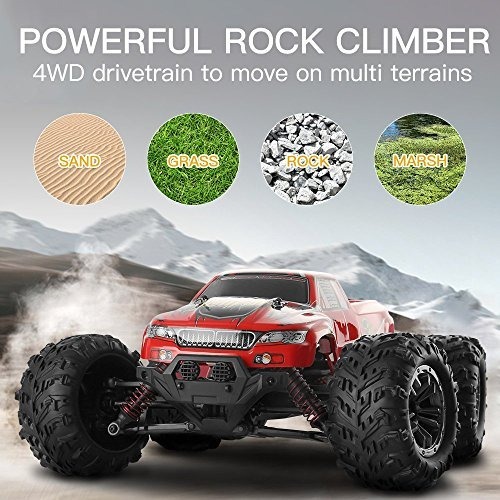 4WD system allows the truck to climb big hills, kick up some dirt and mud and have better control to conquer different awful environments easily! Thanks to the powerful motor, you can break the speed limit up to 36KM/H. Just like a real racing car, it shows an unexpectedly amazing speed and super climbing ability. Meantime, the monster trucks are flexible for driving forward or backward, turning left or right without getting stuck in tough environment. 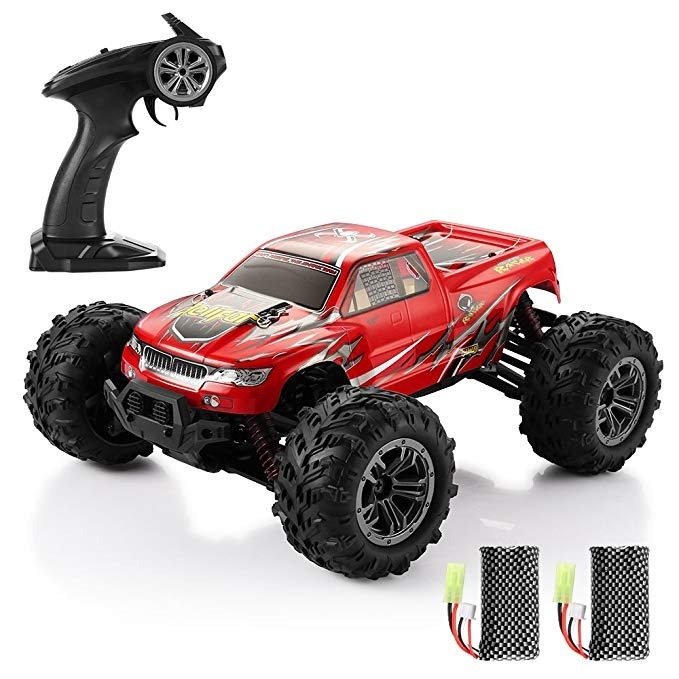 Equipped with strong RC car and remote control, this vehicle is right designed for any level monster RC trucks enthusiast. Stable structure protects itself from wear and tear. Each wheel hangs the spring, the car runs more flexibly and safely. Two rechargeable batteries extend your playing time. When the car bumps unexpectedly, you don’t need to worry, just go on and enjoy the excitement. Semi-waterproof, all-weather fun, you don't need to worry about whether it is bad weather today. Note: The water should not exceed the car body power system, which may cause the parts to fail due to water ingress. Perfect Gift for Your Kids, Families and Friends! Remote control vehicle is funny and educational, it can encourage learning in areas of technology and electronics. Enjoy playing and drive it using the remote controller, play it on a full-speed level to feel the speed. powered with front and gear dual motors supplied with strong power torque to move on any terrain easily and stably,bringing an exciting and real experience for kids.